I cannot begin to tell you how many of my Long Island bankruptcy clients have complained about being victimized by debt settlement companies. Today, Attorney General Andrew M. Cuomo today announced a nationwide investigation into the debt settlement industry, subpoenaing fourteen debt settlement companies and one law firm, including one from Huntington, on Long Island. In a press release he issued today, he called debt settlement companies “a rogue industry” that gives strapped consumers false hopes while socking them with high fees. Many consumers are tempted by debt settlement companies that advertise on TV with fancy, large-budget TV commercials which promise to drastically reduce credit card debts. However, the sad truth is that almost all of these companies engage in unscrupulous practices and make promises about eliminating debt that they can’t possibly fulfill. When these consumers find that the debt settlement companies cannot cure debt problems, they come to me for bankruptcy relief, often in a worse position than they were in before they hired the debt settlement company. In these very difficult economic times, consumers are very vulnerable and become easy prey for many types of con-artists. Companies offering debt negotiation often attempt to take advantage of people who are experiencing personal financial problems during these trying economic times. It seems that many unscrupulous companies are flourishing as the recession deepens, taking advantage of more and more consumers. Just last month I wrote about how Cuomo arrested the owner of a Long Island-based process serving company, American Legal Process, for allegedly providing “sewer service” to thousands of New Yorkers owing debt. As a result of the improper service, individuals would unknowingly default and have judgments entered against them, without the chance to defend themselves. Now Cuomo is going after debt settlement companies which often prey upon consumers who find themselves unable to keep up with credit card payments during these difficult economic times. (See Attorney General Investigating Process Servers for Taking Illegal Shortcuts). “Today, millions of hardworking Americans are finding themselves imprisoned by debt. In response, a rogue industry has stepped in, offering consumers false hope, charging tremendous fees, and leaving them in a worse financial situation,” said Attorney General Cuomo. Here is a list of the fourteen debt settlement companies and one law firm that Cuomo issued subpoenas to this afternoon: American Debt Foundation, Inc.; American Financial Service; Consumer Debt Solutions; Credit Answers, LLC; Debt Remedy Solutions, LLC; Debt Settlement America; Debt Settlement USA; Debtmerica Relief; DMB Financial, LLC; Freedom Debt Relief; New Era Debt Solutions; New Horizons Debt Relief Inc.; Preferred Financial Services, Inc.; U.S. Financial Management Inc. (d.b.a. My Debt Negotiation); and the Allegro Law Firm. The subpoenas seek to uncover the companies’ fee structures, how many people have benefitted from the companies’ services, and what kind of relief the companies are actually providing. Cuomo is also currently investigating Nationwide Asset Services, Inc., based in Phoenix, Arizona, and Credit Solutions of America, Inc., based in Addison, Texas. The debt settlement plans offered by these companies are often inherently flawed and, based upon consumer complaints, it appears that many consumers are being misled regarding the nature of the services offered by these companies. For example, some companies falsely represent that they can reduce consumers’ credit card debt by as much as 75 percent through negotiations with creditors. In addition, the companies often take their fees up front and keep their fees even when they do not provide the promised services. The debt settlement plans are generally premised on consumers aggregating savings, over one to three years, from which both the payment of the company’s fees and any negotiated settlement are to be made. Yet most consumers who are targeted by these companies are unable to meet the savings requirements because of their precarious financial situation. Even for those consumers who can meet the requirements set out by a plan, their amount of aggregated savings is ordinarily insufficient to settle their debts. As a result, many consumers find themselves worse off financially because of these debt settlement plans. As a result, many then come to me to discuss eliminating the debts through bankruptcy, which in many cases, they could have done in the first place. Consumers who believe they are being defrauded by a debt settlement company are urged to contact the Attorney General’s office at 800-771-7755 or to visit the Attorney General’s web site at www.oag.state.ny.us. The services offered by the debt settlement companies are very different from debt negotiation services offered by certain law firm such as my own. With debt settlement companies, the consumer makes monthly payments to the company, and the company first applies these payments to their own fees before any settlement is actually made. Frequently, they sign up consumers who they know, or should have known, would not be able to complete the program. What’s more, the companies keep the fees even when services are not provided! 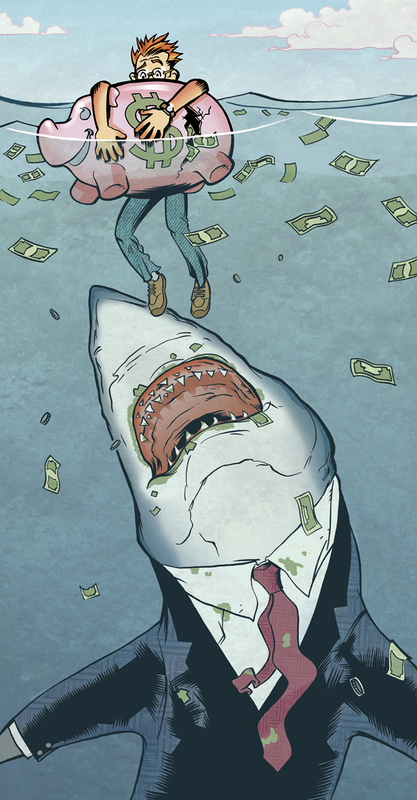 The fantastic image above, entitled, “Sea of Debt” is printed with permission from Memphis illustrator, Shane McDermott, who also teaches illustration and sequential art at Memphis College of Art. Please check out his other work, which is listed on his blog, The Flying Bloghouse. Shane considers this image to be one of his favorites. It heralds the beginning of when he developed his expertise with inking — two years after he started using a brush. Although he may not have intended it at the time, the image superbly illustrates a consumer’s frustration in protecting valuable assets from the predatory characters in the debt settlement industry.